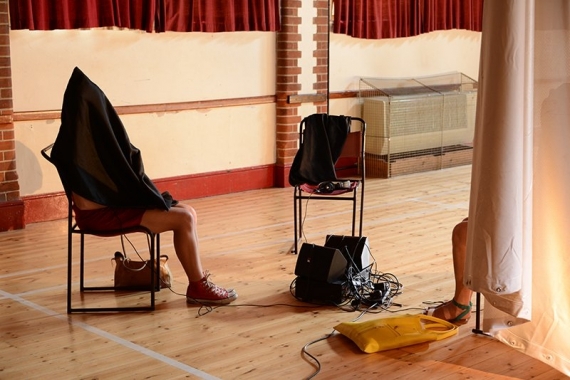 The seventh Whitstable Biennale opened on Saturday with a variety of one-off performances and a series of new film commissions. Dany Louise reports from the small fishing town on the Kent coast. Inside the hall, three people sit motionless on chairs, the top half of their bodies encased in black hoods. A swathe of white material is draped from on high, forming a dramatic backdrop. This is Beginnings by the ARKA Group, part of the Whitstable Biennale. There are only three chairs, the piece is 12 minutes long, and I am the eighth person in the queue, so I have plenty of time to contemplate the experience ahead. It’s an intriguing build up to the work. When it’s my turn, I clutch the heavy piece of warm rock, and a portentous voice booms at me through the headphones: “Matter sits up and asks what matter is”. It’s like visiting a planetarium without the visuals. Whitstable is a charming fishing town in Kent and its biennale is relatively small in scale, although each edition commissions about 25 new artworks. The town is a distinctive location and this is one of the festival’s strengths, allowing for unique site-specific performances to be staged, providing highly unusual experiences. 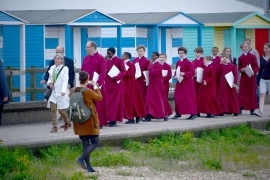 This year, Louisa Fairclough choreographed the Rochester Cathedral choristers, who on the opening weekend sang their choral hearts out in full burgundy surpluses and white ruffs as they lead biennale visitors along The Street, a shingle spit that stretches a mile out to sea at lowest tide. No more than five metres wide at its end, with water lapping on three sides, dusk fell as the choir and assorted visitors communed with the sea and each other on the journey out and back. It was surreal, slightly bonkers and utterly memorable. Fairclough is also showing Absolute Pitch at the Whitstable Museum and Gallery. 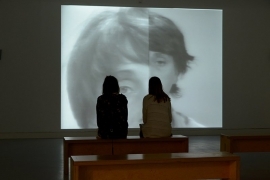 Five filmstrips are stretched across a darkened room, dividing the space obliquely. Each strip plays a single sustained note sung by a chorister from Gloucester Cathedral, heard alongside the rattle of the 16mm film playing through its projector. Large irregular spots of diffuse colour project onto the walls coinciding with shifts in harmony. It is a beautiful installation working on several senses at once. Rosa Ainley presents a haunting audio work of non-linear text and interview fragments about the Pfizer plant outside Sandwich. Accompanied by a ‘pamphlet’ which is more a Modernist short story evoking a dystopian mood, this is far more than oral history. The listener is drawn to construct a fascinating narrative of changing Pfizer company culture, from its local beginnings to mega-corporation. Ex-employees talk with bittersweet hindsight and some cynicism, as with growth came a controlling culture and senior management was increasingly disconnected from the concerns of long-term employees. It made me think of the human cost of globalisation. Jeremy Millar has made a film that depicts a lone survivalist in a winter wilderness. It is full of pathos, never explaining who or where he is, or what he is doing there, a despairing inner life is revealed without a word being said. It’s all in the body language and the bleak howling of the wind. In what is becoming a recognisable style, Millar’s film runs at a stately, meditative pace, accumulating detail and mood with each frame of cracked mud, ripples on water and delicate spider’s web moving in the rain. Millar somehow manages to achieve both a hyper-realism and an impressionist landscape at the same time. 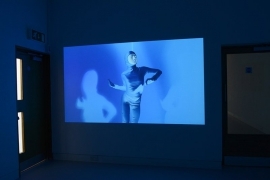 Now in its seventh edition, the Whitstable Biennale focuses on film and performance, although there is always a strong underlying emphasis on words and text. Its ethos is to work exclusively with emerging and mid-career artists based in the UK, providing an opportunity to make experimental work that will move their practice on. Inevitably this means taking the risk that some works are not fully developed and feel more like a work in progress. But even where this is the case – for example, in Rachel Reupke’s Letter of Complaint, her first live performance work – there is much to enjoy in the core idea and execution. Staging three ‘tableau vivants’ held for ten minutes each with impressive self discipline, Reupke depicted power imbalances inherent in the complainant/managerial relationship. The ending though was abrupt, and the audience wasn’t sure whether to wait for more or applaud. There was perhaps a little too much film on this first weekend, with not enough performance or sculptural installations to break up the visitor experience. But this biennale has always varied the programme for each weekend, with one-off performances and talks programmed throughout. 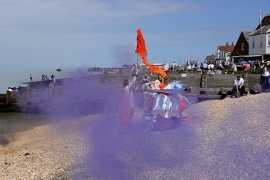 Treats coming up include Zatorski + Zatorski and Richard Wilson with a condensed version of their 2013 work, A Ships’ Opera – a live concerto of ships’ steam whistles, bells, horns, hooters, flares and sirens, mounted on a flotilla of ships off Whitstable Harbour (21 June). S Mark Gubb performs It all began with Richard Burton… on 15 June, a performance lecture on a coach tour of his native East Kent. 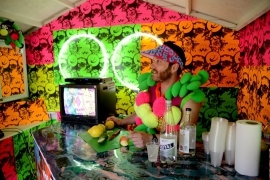 And there are several opportunities to participate in Ben Judd’s performance work Vast as the Dark of Night and as the Light of Day, taking place for 12 people at a time on a barge at sea (14 and 15 June). If that isn’t enough to tempt you to Kent’s south coast over the next two weeks, the Whitstable Satellite features work from over 90 artists in a variety of town locations.